The 42 graphics submitted for the competition were judged by all attendees at the 2018 TSCN workshop. It was a tough choice because literally all of the entries were of first rate quality. The top three winners received monetary awards. We will repeat this competition throughout the fall, so get creative in your Cafe promotional materials and win the prizes. $30 first place, $20 second place and $10 third place. 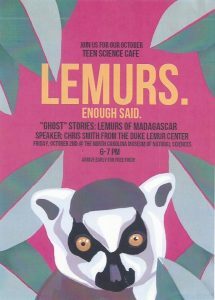 First prize for “Lemurs. Enough Said” went to the North Carolina Museum of Natural History site of the Open Minds Teen Science Cafés-Raleigh. 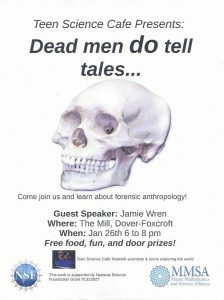 Second prize for “Dead men do tell tales…” went to the TSC for ME-Denver-Dover site of the Maine Math and Science Alliance. Graphic by Harris Millette, 11th grade. 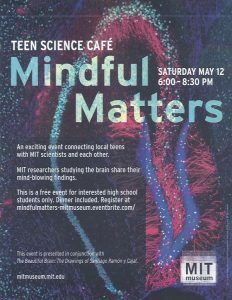 Third prize for “Mindful Matters” went to the MIT Museum Teen Science Café. Join Us, Teen Science Café, Lead and Learn! Emergency Response Technology: Natural disasters, technology, and teen science cafés! Matter vs Antimatter: Why are we here?